Litchfield National Park is a tourists' favourite within the Australian Outback and from the moment you arrive you will begin to see why. Litchfield truly is an oasis in the desert and boasts waterfalls, breathtaking waterholes, dramatic landscapes, wildlife and incredible walking tracks. You can spend as little as one day in the park, taking a quick dip in each of the plunge pools and rock holes on the drive through, but to really experience the true beauty of Litchfield it's best to stay at least two days. After all, the park does span 1,500 square-kilometres, and a spot like this is too beautiful to rush. This unspoiled wilderness is one of the scenic highlights of the Northern Territory and is an absolute must on any campervan holiday in Australia's top end. 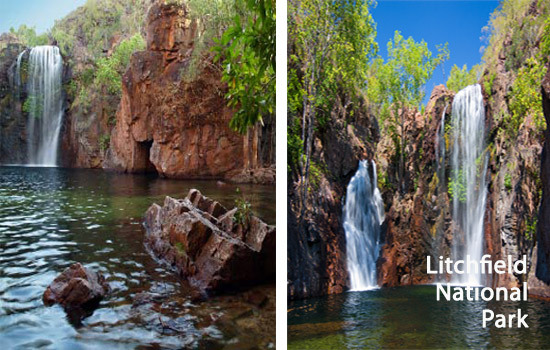 Litchfield National Park is located 20min drive from Batchelor, 100km southwest of the capital city of Darwin. The distance from Alice Springs is approximately 1500 kilometres or the equivalent of a two day drive. There are two main airports tourists use to fly into the Northern Territory. Alice Springs Airport and Darwin International Airport are both located near campervan depots and are ideal places to begin your campervan holiday in Litchfield National Park. Campervan travellers can choose to either pick up their vehicle from Alice Springs or Darwin. A one-way rental is a popular option for those wishing to simply travel between the two and not backtrack on where they have already driven. There are no park use fees for entry into Litchfield National Park. Litchfield National Park breaks all expectations of the ‘dry' outback, with its glorious waterfalls and picturesque swimming holes. Some of the most popular of these include the Buley Rockhole, the Wangi Falls, and the Tolmer Falls. The Buley Rockhole is a series of waterfalls and rock holes, where you will find your own spot to swim and relax. Open all year round, camping is available with toilet facilities only and camping fees do apply. Wangi Falls is one of the park's most visited attractions, is easily accessible and is open all year round. However, sometimes swimming is prohibited, especially during the wet season, when water levels rise due to the heavy rain. Tolmer Falls are open all year round, and cascade over high escarpments into a deep plunge pool. With a viewing platform at the top, access to the bottom of the falls has been restricted to protect the habitat of colonies of ghost bats and orange horseshoe bats. There are parts of the park that can only be accessed by 4WD vehicles. Litchfield offers a wide range of walking tracks, from short walks to those that must be attempted over several days. A perfect example is the Greenant Creek Walk, which wanders through rainforest and leads to an uncrowded plunge pool. The walk is approximately 2.7 kilometres return, of moderate level and can usually be completed in one and a half hours. For those searching for day treks the Wangi Falls Walk, Walker Creek Walk, and The Lost City Walk are among the better options. Some of the most popular longer walks include the Tabletop Track and the Florence Creek Walk. Both of these walks take hikers along trickling creek lines, cascading waterfalls, crystal clear pools and undisturbed pockets of tropical monsoon rainforest. The Blyth Homestead is a must-visit for those wishing to uncover a little of the park's history. This homestead was built in 1929, withstanding the test of time and telling the story of the tough times that were experienced in the park in the olden days. Access is by 4WD only, and you will need to check road conditions in the tropical summer ‘wet' season. The Magnetic Termite Mounds are another popular talking point of the park, standing at attention and all facing the same way. The mounds were built by thousands of termites and stand up prominently within the grassy fields of Litchfield. The mounds' thin edges point north-south minimising their exposure to the sun, keeping the mounds cool for the termites inside. The climate in Australia's top end is described as tropical, with the seasons generally divided into two; the wet and the dry. Litchfield experiences an average yearly temperature of 32 degrees Celsius and the summer months are often described as the park's most beautiful. Humidity levels tend to rise at the end of the year, just before the monsoon season begins. During the summer ‘wet' season, be prepared for the weather to change without notice and always check weather reports before travelling. Litchfield National Park is spectacular all year round, adding to its appeal as a fantastic destination for a campervan holiday. However, during the wet season the roads can get slippery making them only suitable for 4WDs. Some areas, such as Wangi Falls, also become unsafe during this season which usually leads to their closure and restricts swimming. The best time to visit would have to be at the beginning of the dry season, as this is when the roads have dried up but the waterfalls are still pumping. The best time to explore the park is in the morning, as temperatures are lower and you will avoid walking in the hottest part of the day. During the day it can get incredibly hot in Litchfield National Park, therefore it is best to dress in loose clothing that will still protect you from the sun and insect bites. Sunscreen, wide brimmed hats and sunglasses are necessities, while insect repellent is also essential to have on hand. If you plan on swimming in the park be sure to put on plenty of sunscreen. Common wildlife species found within Litchfield National Park include the Wallaroo, the Agile Wallaby, the Sugar Glider (a type of possum), Northern Brush tail Possum, the Fawn Antechinus (marsupial rat), Black and Little Red Flying-Foxes and the Dingo. The caves near Tolmer Falls are home to a colony of the rare Orange Leaf-Nosed Bat and the Ghost Bat. Litchfield is a habitat for hundreds of native bird species. Black Kites and other birds of prey are common during the dry season. The Yellow Oriole, Figbird, Pacific Koel, Spangled Drongo, Dollarbird and the Rainbow Bee-eater inhabit the sheltered areas close to waterfalls. A species of marsupial mouse, the Rufous-Tailed Bush-Hen, a native frog, and the Primitive Archerfish, occur in the Wangi Falls area. Litchfield National Park is generally accessible all year round via the sealed roads from Batchelor. The park can also be reached via the Cox Peninsula Road; however this road is unsealed and therefore campervans are not permitted to travel on it. The road to the Lost City is also prohibited for travel in a campervan. It is absolutely necessary to bring plenty of water to the MacDonnell Ranges, regardless of the length of your stay. Ensuring you always have fuel in your petrol tank is also important as distances between roadhouses can be vast. It is also a good idea to bring a suitable amount of food. The shops within the park are quite expensive, so it works out a lot cheaper to bring your own in. Appropriate clothing, sun protection, insect repellent and covered walking shoes are also vital, because of the changing weather conditions. This is the outback, so remember it gets extremely hot! Another must-have for your campervan adventure in the MacDonnell Ranges is your camera. The ranges are truly remarkable sights so being snap happy will ensure you can keep your memories of it forever. As with every Australian National Park, take nothing but photos and leave nothing but memories. Most roads within Litchfield National Park are sealed and suitable for campervans to travel on them. As with driving anywhere in the outback, it is important to drive carefully at night and always keep an eye out for wildlife. In the other extreme, when it is flooding in Litchfield, do not attempt to cross flooded bridges or causeways. Most flash floods recede in 24 hours so it is best to wait it out. Even a shallow torrent can be strong enough to push a vehicle off the road, and it is better to remain safe. Fees do apply to all of these campgrounds and no powered sites are available. If you wish to stay in a commercial caravan park there are several located just outside the park. Batchelor is regarded as the gateway to Litchfield National Park and is a great place to stock up on supplies before heading in. In the park itself you can enjoy a meal at either the Monsoon Cafe or the Wangi Kiosk. However, keep in mind that the prices here are incredibly expensive. The best option is to stock up on supplies in Darwin, where you will find everything you need at a much more affordable price.